Chameleon Green is an opaque multicolored streaky color commonly called slag glass. This type of glass is not often made & each item is different and no two pieces are alike. This Willow Green Opalescent vase is hand painted with a stunning stylized pattern in shades of dark green, blue, burgundy, and gold. The crimped top is ringed with cobalt blue glass. Willow Green is a gorgeous soft color that is complementary to many color schemes. 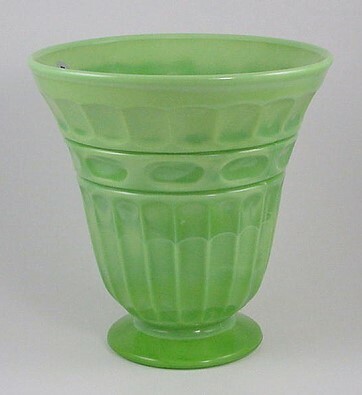 The mould is a reverse melon shape that has been popular for many years with Fenton collectors. Designed by Robin Spindler, the hand painted motif features touches of deep violet and mauve on white petals. The design continues around the top. The bottom portion has a slight white opalescence along the top scalloped edge.